Have you had difficulty communicating with the insurance carrier? Did you hire an appraiser and the claim was denied or delayed? Is your time valuable and insurance claims give you a headache? Is your claim too small for an attorney to be interested in it? If you answered yes to any of these questions, hiring us is the right choice. We are revolutionizing the claim process by taking it off your hands and paying you back once the claim settles. It’s that simple. This is the reduction in a vehicle’s value after a wreck. In other words, your car lost some of it’s value because of someone else’s negligence. This money is owed to you in cash by the other driver’s insurance. However, as i’m sure you’ve experienced, these insurance carriers are impossible to work with and collecting this money is very difficult. Some of the worst carriers to collect Diminished Value from are: State Farm, USAA, United, Auto Owners and Safeway. 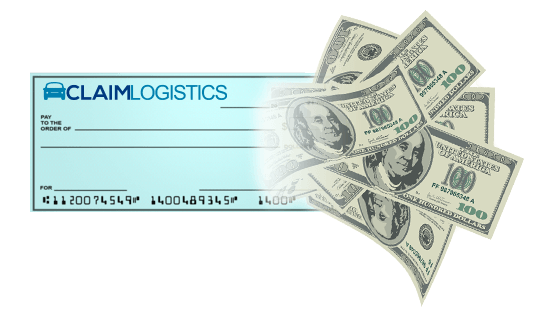 In 4 easy steps, Claim Logistics will turn your bad claim into cash. First, we make sure you have a viable claim. So, we need a copy of the repair estimate and details about your wreck. We also need to make sure that you’ve not signed any documents that prevent you from pursuing the claim any further (release of liability for example). In other words, we take over the claim. In Georgia you can legally reassign property damage claims to other people or entities. Think about it this way, you’re going overseas for a year and you have a claim you need settled, you give a power of attorney to your brother to handle the claim for you. Reassignment is a little different as the Assignee (Claim Logistics Ltd Co) will become the Assignor (you). After we receive the assignment letter from you, we will file a updated claim and demand against the at fault insurance. Our expert negotiators will squeeze every last penny from the insurance company and make sure the claim is properly funded. If need be, we will file suit against the at fault party in order to recover the loss. Once we win the case, we will pay you the flat fee we agreed to according to the reassignment agreement signed. EASY PEASY. 💭 What happens with the check I already have from the carrier? You write VOID on this check and send it back to the insurance company. We will write you a check of equal value. 💭 What happens if I already cashed an insurance company check? That is fine as long as you’ve NOT signed a release of liability form. 💭 What happens if I’ve already signed a release of liability? 💭 What happens if I’ve already paid for an appraisal from a third party appraisal company? We suggest you ask for a refund from them, in some instances we will reimburse you for the report cost if the company you’ve hired is credible and reliable. 💭 What happens if you don’t get any additional money from the carrier? Well, you couldn’t get any more money before you hired us, so you’re back where you started. At least you’ve tried every single avenue. “Tis better to have loved and lost than never to have loved at all” type of scenario. 💭 What’s my percentage of the final settlement? Every claim is different, it is usually reversely proportional to the amount of time and effort it takes to handle the matter. Drop us a line and we will be glad to assist. Claim Logistics Contact Form.